Ted Cruz spoke to a crowd of supporters after being defeated by Donald Trump in Nevada&apos;s Republican caucus. Donald Trump will collect the most delegates from the Nevada caucuses. But even though he won by a large margin, he might not get a majority of the 30 delegates at stake. Trump won at least 12 delegates and Marco Rubio and Ted Cruz won at least five apiece. Eight delegates are still left to be allocated. Nevada Republicans award delegates in proportion to the statewide vote, so a candidate can win a delegate with as little as 3.3 percent of the vote. Overall, Trump has 79 delegates, Cruz has 16 and Rubio has 15. John Kasich has five delegates and Ben Carson has three. Eleven names were on the statewide ballot, but Donald Trump easily outdistanced the other candidates still in the race. Read: The Nevada caucuses are a mess. Again. Ted Cruz says he can’t wait to get home to Texas. Cruz spoke at a Tuesday night appearance at a Las Vegas-area YMCA after an underwhelming performance in Nevada’s caucuses. With returns still coming in, Cruz and rival Marco Rubio were locked in a tight race for second place. Cruz was heading to Texas shortly after the speech. Cruz insisted that he’s the only Republican candidate who can beat Nevada caucus winner Donald Trump. Republican presidential front-runner Donald Trump is basking in his Nevada caucus victory by vowing to keep the open the military detention center in Guantanamo Bay, Cuba. Trump also drew loud cheers for his vow to build a wall along the southern border and his instance that Mexico will pay for it. Trump offered shout-outs from the stage to several of his billionaire friends, including Phil Ruffin, who owns the Treasure Island, and casino developer Steve Wynn. ‘‘Now we’re going to get greedy for the United States,’’ he says. Donald Trump is celebrating his win in the Nevada Republican caucuses with a prediction that he’ll soon claim the GOP presidential nomination. Trump has won three contests in a row after finishing second in the leadoff Iowa caucuses. He’s in a strong position headed into next week’s Super Tuesday contests, where voters in a dozen states will cast ballots in presidential primaries. Nevada caucus-goers who decided who to support before the last week were key to Donald Trump’s victory in the state, according to early results of the entrance poll conducted among people arriving at their caucus sites. Among those who decided who to support in the last week, about 4 in 10 supported Marco Rubio. About a quarter supported Trump and about 2 in 10 supported Ted Cruz. But a majority of those deciding before the last week supported Trump, and they accounted for about 7 in 10 caucus attendees. The survey was conducted for The Associated Press and the television networks by Edison Research as Republican voters arrived at 25 randomly selected caucus sites in Nevada. The preliminary results include interviews with 1,545 Republican caucus-goers and have a margin of error of plus or minus 4 percentage points. About 3 in 10 Nevada caucus attendees said the quality that mattered most to them in choosing a candidate is that he shares their values, according to preliminary results of the entrance poll. Caucus winner Donald Trump was supported by nearly 9 in 10 of those caring most about having a candidate who ‘‘tells it like it is’’ and about 6 in 10 who wanted a candidate who can bring change. Rubio was the favorite among those who cared most about electability, and Cruz among those wanting someone who shares their values. A crowd of several hundred supporters gathered at Donald Trump’s Nevada watch party at the Treasure Island hotel in Las Vegas burst into cheers and screams the billionaire businessman won the state’s caucuses. Some shouted ‘‘USA! USA!’’ as the caucus results rolled in. Many of the supporters in the crowd are from out-of-state and decided to drop by the celebration while in town. Trump is expected to address the crowd later Tuesday night. Nevada caucuses winner Donald Trump was supported by 7 in 10 of those who preferred an outsider, according to early results of the entrance poll conducted for the Associated Press and television networks. Nevada caucus attendees were more likely than primary or caucus attendees in any state so far to prefer an outsider candidate, the preliminary results show. Marco Rubio was supported by a majority of Nevada caucus-goers who wanted to support a candidate with political experience over a political outsider. That’s a silver lining for Rubio. Nevada is the first state where any candidate earned majority support among those wanting a candidate with political experience over an outsider. Donald Trump has won the Republican presidential caucuses in Nevada, giving the billionaire businessman three straight wins in the race for the GOP nomination. Marco Rubio and Ted Cruz are vying for second place, far ahead of John Kasich and Ben Carson. Preliminary entrance polls taken of Republican caucus-goers show that nearly 6 in 10 are angry at the way the government is working, and about half of them supported the billionaire businessman. Trump was also supported by about 6 in 10 of those who said they care most about immigration, and nearly half of those who said they care most about the economy. The race for the Republican nomination now moves on to next week’s Super Tuesday, when a dozen states will hold presidential primaries. Among early arrivals at Nevada’s Republican caucuses, nearly 6 in 10 say they are angry at the way the government is working. Entrance polls conducted as people arrived at caucus locations in Nevada show another third saying they are dissatisfied with the government. Those early arrivals are most likely to say the top issues facing the country are the economy or government spending, each listed by about 3 in 10 caucus. Immigration and terrorism were each chosen by slightly fewer — about 2 in 10. The survey was being conducted for The Associated Press and the television networks by Edison Research as Republican voters arrive at 25 randomly selected caucus sites in Nevada. The preliminary results include interviews with 925 Republican caucus-goers and have a margin of error of plus or minus 5 percentage points. Cheering supporters and packs of selfie-seekers greeted Republican presidential candidate Donald Trump when he stopped by a Las Vegas caucus site Tuesday night. The billionaire businessman ran through a list of campaign promises, including taking case of veterans and scrapping the president’s health care law. He then posed for photos and greeted people who had lined up to meet him after they’d cast their ballots. The same caucus site was reported to be having problems with double voting, long lines and not enough ballots. Party officials say they are looking into those reports. Other caucus sites appear to be running smoothly with no reports of difficulty. As Nevada Republicans caucus across the state, the Republican National Committee says it is concerned about reports of double voting at a troubled caucus site in Las Vegas. RNC spokesman Fred Brown acknowledges there have been reports Tuesday night of double voting, long lines and not enough ballots at Palo Verde High School. Some people were being turned away and directed to another location. Candidate Donald Trump stopped by the school as part of his last-minute campaigning. Brown says the double-voting problem appears to be limited to one part of a caucus site where different precincts have been combined. The party plans to compare the number of paper ballots cast to the sign-in sheet to determine whether any double voting actually occurred. Other caucus sites appear to be running smoothly with no reports of difficulty. Marco Rubio says he can unify Republicans before the November election and appeal to Democrats who ‘‘never’’ vote for GOP candidates. The Florida senator spoke Tuesday night during a rally at a western Michigan auto supplier, two weeks before the state’s primary. Rubio says Republicans must win the presidency and the GOP race ‘‘cannot be about just making a point.’’ In an apparent shot at Donald Trump, Rubio told a crowd of more than 1,000 that he himself didn’t become a conservative when he thought about running for president. Rubio says he would rebuild a ‘‘gutted’’ U.S. military but de-emphasize the federal government’s role in other matters, leaving those issues to state and local governments. Donald Trump and Nevada Republicans are warning that it’s improper to videotape Tuesday night’s GOP caucuses. Trump sent a letter to the state Republican party complaining that an unnamed Cruz backer was quoted in the Wall Street Journal advising caucus-goers to bring their cell phones and videotape the proceedings Tuesday evening. Past Nevada Republican caucuses have been roiled by allegations of improper behavior. Nevada Republicans responded by confirming that it is against party rules to record the caucus proceedings. ‘‘The Nevada Republican Party is committed to assuring the caucusing process is free from intimidation, threats or nefarious activity of any kind,’’ the party said in a statement. Members of the Culinary Union are planning to protest in front of Trump Hotel Las Vegas while Nevada voters weigh in on the resort’s polarizing namesake. Culinary Union, the casino workers union, is staging a rally from 4 p.m. to 6 p.m. Tuesday, at the same time as Nevada’s Republican caucus. Donald Trump is expected to do well in the contest. The union wants to represent the hotel’s workers, but the hotel is objecting to a recent union vote. Culinary officials say the hotel’s management wants to draw the matter out in a lengthy legal battle, and point out that Trump made a deal with his employees in Canada. Officials with the hotel didn’t immediately have comment on the demonstration. The union represents 57,000 workers and hasn’t endorsed in the 2016 presidential election. Republican Ted Cruz says he’s facing the same sort of opposition from the Washington establishment that tried to take Ronald Reagan out before he unseated Jimmy Carter. Cruz is campaigning on Nevada’s caucus day Tuesday with Texas Nevada Attorney General Adam Laxalt, the grandson of Sen. Paul Laxalt, one of Reagan’s best friends. Laxalt introduced Cruz to a crowd of about 400 at an outdoor park in rural Minden during the second of four campaign stops hours before Republicans start to cast their votes. Cruz said Republicans are asking the same questions about him that they asked of Reagan back then: Can he win? Is he too conservative? Marco Rubio says the Republican race for the presidential nomination can’t be about ‘‘making a point’’ by picking a political outsider. The Florida senator and GOP hopeful didn’t mention Donald Trump or other rivals by name during a rally in a Minneapolis hotel ballroom Tuesday. But he urged voters to look past candidates who exude anger or a willingness to say outlandish things. Rubio is riding a wave of recent high-profile endorsements but is still trying to score a win as candidates shift their focus to later-voting states. His stop in Minnesota came as Nevada Republicans prepared to caucus and a week before the Midwestern state’s own caucus on Super Tuesday. He was set to head to Michigan Tuesday evening to rally voters ahead of its March 8 primary. Republican presidential front-runner Donald Trump is floating the idea of turning the detention center at Guantanamo Bay over to Cuba. Trump was delivering a rally speech in Sparks, Nevada Tuesday when he addressed President Barack Obama’s speech earlier in the day outlining his plan to close the detention center. Trump vowed to keep it open - ‘‘and we’re going to load it up with some bad dudes,’’ he said - and took issue with the facility’s operating cost, which current stands at $445 million a year. The detention center is located on the U.S. Naval base at Guantanamo Bay, which the U.S. pays a nominal fee to lease. The lease was reaffirmed by a 1934 treaty that allows the U.S. to pay about $4,000 a year. It says the termination of the lease requires the consent of both the U.S. and Cuba governments, or the U.S. abandonment of the base property. CNN says it will no longer book Donald Trump supporter Roger Stone as a guest on the network, after he tweeted profane remarks about one of the network’s political commentators. The liberal media watchdog Media Matters for America, which has followed Stone’s tweets, said the political consultant and author has appeared on CNN seven times within the past month. Donald Trump warned his Nevada supporters to keep an eye out for what he described as ‘‘dishonest stuff’’ at their caucus sites tonight and report it to Trump volunteers or to police. Trump went on to say that some type of fraud is they only way he could lose the election, noting how much time he’s spent here and the Las Vegas hotel that bears his name. Trump also reminded voters that, unlike in Iowa,’’ You don’t have to sit around like a bunch of dopes. You can go in and you vote’’ and leave. Unscripted moments are typical for Republican presidential contender John Kasich. The second-term Ohio governor delivers even major addresses without a script or a teleprompter. On the campaign trail, he’s insistently impromptu — even if it means risking a foot in his mouth. The latest example came on Monday, when Kasich said ‘‘women who left their kitchens’’ helped deliver him his first political victory in 1978. Feminists, including Democrat Hillary Clinton, balked at the stereotype. Republican presidential candidate John Kasich says he is unsure if he was meant to be president. Speaking at a town hall at Kennesaw State University in Georgia, Tuesday, the Ohio governor says he’s not sure if his purpose is to be president. When asked about his rivals, Kasich rejected suggestions from an audience member it was time to take the gloves off. Kasich’s appearance at the university was his second of the day in the Atlanta area. Earlier, he addressed lawmakers at the Georgia State Capitol and told reporters he had no plans to suspend his presidential campaign. Marco Rubio is receiving a Super Tuesday advertising boost from a supportive outside group. Conservative Solutions PAC, a super political action committee run by his close allies, is planning for about $3.5 million in television ads in eight of the 10 states that weigh in March 1. The super PAC’s heaviest spending - $1.4 million - is in Texas, which has several costly media markets and where Rubio competitor Ted Cruz, one of its senators, was leading in recent polls. Conservative Solutions PAC is one of the few GOP groups - or candidates - with advertising plans ahead of the March 1 contests. Texas Sen. Ted Cruz says the detention center in Guantanamo Bay, Cuba, should not be closed as President Barack Obama has proposed. Cruz says shutting down the Guantanamo Bay facility will result in the release of prisoners who will ultimately need to be recaptured. Cruz says he fears Obama may also turn Guantanamo Bay back over to the Cuban government. The Obama administration on Tuesday sent Congress its plan to shut down the detention center and relocate detainees to a U.S.-based prison. Democratic presidential hopeful Bernie Sanders says Wall Street and billionaire campaign donors have an unfair advantage in the U.S. and it will take a ‘‘political revolution’’ to lessen their political clout. Speaking Tuesday to thousands of supporters at Norfolk’s Scope arena, Sanders rarely mentioned rival Hillary Clinton, reiterating his belief that she was wrong on the NAFTA trade deal and is too close to Wall Street campaign donors. Virginia is one of several states holding its primary on the so-called March 1 Super Tuesday. While preference polls have shown Clinton doing well in the moderate swing-state, the Sanders campaign says it is confident with a week to go until the contest. Clinton recently began running TV ads in Virginia and former President Bill Clinton is scheduled to campaign on her behalf in Northern Virginia and Richmond on Wednesday. Supporters of Republican presidential front-runner Donald Trump are stressing to potential caucus-goers that they won’t need to stick around for hours, like in Iowa, to cast their ballots Tuesday evening. 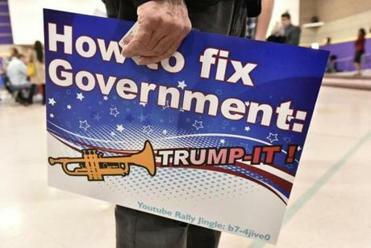 ‘‘Do you know you can vote and go, you don’t have to wait around?’’ Trump volunteer Walter Seip, 74, a retired army colonel, told rally-goers as they lined up for a Trump event last night at a Las Vegas hotel and casino. ‘‘Name of the game is you drive people in there to vote for Trump,’’ he explained. Trump’s son, Eric, stressed the same message in a Twitter post that was re-tweeted by his father Tuesday morning: ‘‘Nevada remember you can ‘‘Vote and Go’’ - walk in vote and walk out!’’ he wrote. Trump has made no secret of his disregard for the caucus system since coming in second in Iowa. He’s argued that traditional primaries offer a more accurate gauge of a candidate’s support. Nevada’s influential Mormons aren’t being taken for granted in the state’s Republican presidential caucuses Tuesday. Members of the Church of Jesus Christ of Latter-day Saints only account for 4 to 5 percent of the population in Nevada, where the first white settlers were Mormon and the faith’s bastion sits across the state line in Utah. But they are politically involved, apt to turn out and perched at the highest levels of Nevada’s political structure. They made up about a quarter of the electorate in the 2012 GOP caucuses won by Mitt Romney, a Mormon, according to voter surveys. Many influential Mormons have flocked to Marco Rubio, a Floridian who was part of the church for a few childhood years when he lived in Las Vegas. Rubio now is a practicing Catholic and still has relatives in the state. Ted Cruz, too, played for Mormon support, particularly to a subset of conservatives most concerned that changes on the Supreme Court could erase religious liberties. The former campaign spokesman for Ted Cruz says he is going to keep supporting the Texas senator as a voter, but he no longer works on the campaign in any capacity. Rick Tyler was asked to resign on Monday by Cruz after he tweeted a story that falsely accused White House hopeful Marco Rubio of insulting the Bible. 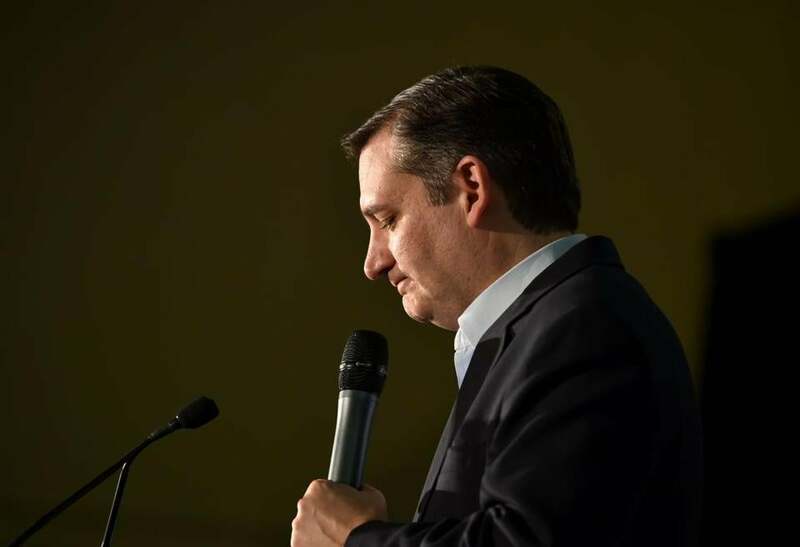 Cruz was forced to steer away from his campaign message on Monday, the day before the Nevada caucuses, addressing the Tyler situation and saying he had no choice but to seek his resignation. Donald Trump accused Cruz of being disloyal. Democratic presidential candidate Hillary Clinton took her sharp criticism of Wisconsin auto parts maker Johnson Controls Inc. from the campaign debate stage to the airwaves. The Clinton campaign began airing a new television spot in the Duluth, Minnesota market Tuesday that slams the suburban Milwaukee manufacturer, claiming Johnson Controls benefited from auto industry bailout years ago when the auto industry was unstable and is now moving its headquarters to Ireland as part of its merger with Tyco International — a move she says ‘‘shirks’’ its tax liability in the U.S. The automotive sector of Johnson Controls, one of Wisconsin’s largest companies, had $20 billion in sales last year. As Republicans in Nevada prepare to caucus for their picks for a GOP presidential nominee, Ohio Gov. John Kasich is telling lawmakers in Georgia the strength of the United States rests in its people, not in its government. He’s speaking before both the Georgia House of Representatives and Senate Tuesday ahead of the state’s primary on Super Tuesday. Kasich’s appearance at the Georgia State Capitol is the first of three scheduled in the Atlanta area. He also plans to hold town halls at Kennesaw State University and Sandy Springs City Hall. Republican presidential hopeful Marco Rubio is criticizing President Barack Obama’s effort to close the detention facility in Guantanamo Bay. Rubio says voters have the right to be frustrated and points to Obama’s move as one reason why. ‘‘This makes no sense to me,’’ he told a morning rally in Las Vegas Tuesday, with hours to go before the Nevada caucuses get under way. Rubio says Obama may return the land to Cuba. ‘‘We’re not giving back an important naval base to an anti-American communist dictatorship,’’ Rubio says. He adds that the Guantanamo prisoners don’t belong on U.S. soil. ‘‘These are literally enemy combatants.’’ Rubio promises that he will ship terrorists to Guantanamo when he’s president. Texas Sen. Ted Cruz is toughening his position on whether the more than 11 million immigrants living in the country illegally should be found and deported. Cruz said in a Fox News interview late Monday that anyone living in the U.S. illegally should be sought out and deported. That marks a shift for Cruz who said last month while campaigning in Iowa that he opposed dispatching a special force to deport undocumented immigrants. Instead, Cruz said then they would be caught through existing law enforcement agencies. But in Monday’s interview on Fox, Cruz was asked whether he would send federal law enforcement officers to the home of an immigrant known to be living in the country illegally. Cruz says, ‘‘You’d better believe it.’’ But he says there is no ability to do that now because the U.S. doesn’t have a biometric exit-entry system to know when someone has overstayed their work visa. Filmmaker Spike Lee is endorsing Bernie Sanders for president in a South Carolina radio ad. Lee also notes that the Vermont senator participated in the march on Washington and protested segregation in Chicago public schools. A writer, director and actor, Lee’s films include ‘‘Do the Right Thing,’’ and ‘‘Malcom X.’’ His most recent movie ‘‘Chi-Raq’’ is about gun violence in Chicago. Lee endorsed President Barack Obama in 2008 and 2012. The lone outside group making a concentrated effort to stop Donald Trump from becoming the Republican presidential nominee is circulating a memo in hopes of netting new big donations - or encouraging the four remaining GOP candidates to take on Trump more directly. Katie Packer, the Republican strategist leading the group wrote which, in the memo, said Tuesday that Our Principles is deciding over whether to attack Trump through a costly national media plan or to target him in key March 1 states.